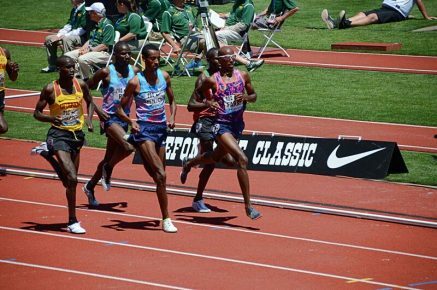 27th May 2017 – Reigning double Olympic and World Champion Sir Mo Farah (GBR) gave evidence that he is still the man to beat this season as he overcame a world class field at the latest IAAF Diamond League event in Eugene. Racing over 5000m, Mo sat off the early pace but at the same time close enough to observe the leaders. With a mile remaining he took closer order in fourth place and then took the lead with 800m to run. From here he controlled the race, allowing no one to pass until finally showing the turn of speed up the home straight that has won him so many races and medals before. He crossed the line in a world leading time of 13:00.70. Current world leader in the women’s 5000m Hellen Obiri (KEN) stepped down to the 1500m and gave a very strong account of herself. She pushed Olympic Champion Faith Kipyegon all the way to the line, taking second place in 4:00.66. Shannon Rowbury (USA) ran a seasons best of 4:04.61 in ninth. Shamier Little (USA) has been in blistering form so far this season and this was evident again here. Despite running from lane one the reigning collegiate champion took second place in the 400m hurdles and set new personal best figures of 53.44 seconds. Training partners Vincent Kibet (KEN) and Bethwel Birgen (KEN) continue to trade places in races with Vincent coming out on top this time. He placed fourth in a high quality men’s mile setting a new PB of 3:51.17. Bethwel was unfortunate to get caught up in a fall with just over a lap remaining but stayed on his feet to place ninth in 3:53.50. In the sprints Jenna Prandini (USA) was warmly welcomed by her Oregon fans and rewarded them with a seasons best of 22.54 seconds over 200m. Matthew Hudson-Smith (GBR) clocked 46.08 seconds over 400m in his seasons opener. In the Friday evening events Laura Roesler (USA) ran 2:01:89 over 800m. At his home BMC Grand Prix, Tom Lancashire (GBR) put in sharp effort over 800m, taking third in 1:48.56.